Discover a Christ who is alive and active in the lives of ordinary people. In a culture where those who claim the name of Christ seem to live most of their days in apathy and spiritual boredom, From Plowing to Preaching shares event after event of God's personal intervention in providing leadership, provision, and blessings. 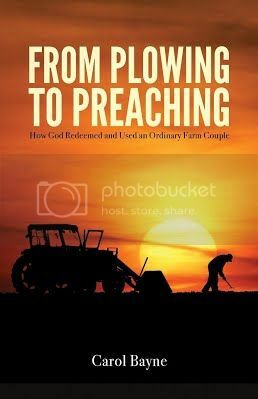 Author Carol Bayne writes of the amazing ways God revealed Himself in His redemption of herself and her farmer husband Don Bayne, and how He led them from a life as farmers to Bible school and then to pastoring their home church. Carol's heart is to reveal a Christ who is very much alive and active in the lives of ordinary people who are totally committed to His purposes and glory. In short, From Plowing to Preaching will remind the reader that with an authentic faith in the risen Lord and an eternal perspective, the Christian life will be one of adventure, purpose, meaning, and hope.